Mrs. Thomas reviews the learning targets with her class and uses a sampling strategy to find out where her students are in their learning. Accurately recall and use the key terms of abiotic, biotic, ecosystem, and biomes. Determine the difference between abiotic and biotic factors. LS:6 In any particular biome, the number, growth and survival of organisms and populations depend on biotic and abiotic factors. When is it appropriate to do a quick check for understanding? Why can a formative check be more effective than a graded quiz? How does Mrs. Thomas respond when students miss the correct answer? What was the purpose of randomly tossing the ball to students during the review? How did the sampling strategy provide information for the teacher? 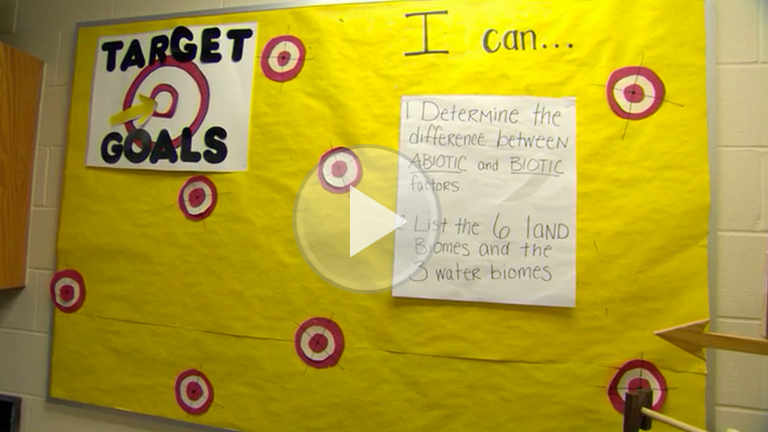 Why is it important to review and state the learning targets during each class? How will you move your students from “student involvement” to “student ownership”? Enroll in the Collecting and Documenting Evidence of Learning module.